On Sale Now! 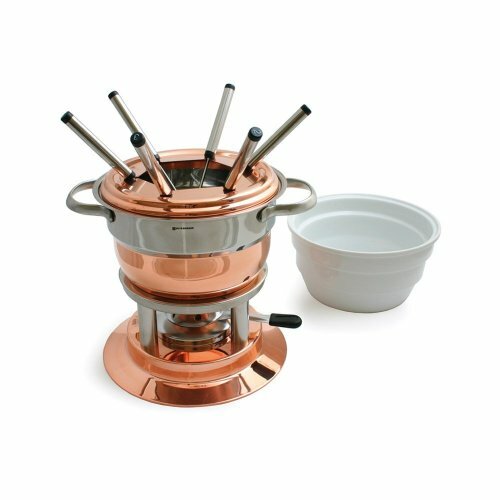 Save 9% on the Swissmar Lausanne 11 Piece Copper Fondue Set by Swissmar at Just Gathering. SKU: 10. MPN: F66415. Hurry! Limited time offer. Offer valid only while supplies last. Includes stainless steel pot, copper spatter guard & rechaud, white ceramic insert, six fondue forks and dual function burner. Simply remove the white ceramic bowl, put the spatter guard in place and you're ready for a meat fondue. For cheese and chocolate fondue add water in the fondue pot, put the white ceramic bowl in place and you're ready to go.